Every day the tension mounts as Antifa is allowed to do whatever it wants to conservatives on the street. 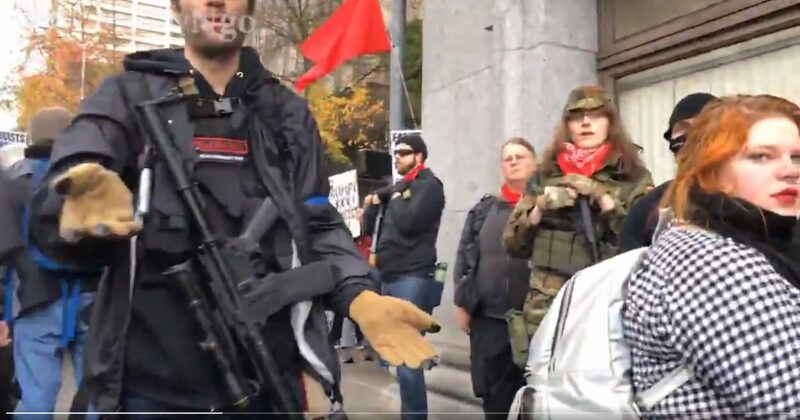 In downtown Seattle on Friday, a group of conservative 3 Percenters held a peaceful rally that was protested by an unruly gang of Antifa scumbags who harassed and physically assaulted journalist Andy Ngo who was recording the event on video. Not only was this harassment and intimidation allowed, not to mention the death threat, but a police officer on the scene told Ngo that he must leave as he was inciting the Antifa anarchists, proudly flying their red communist flag and trying to control who could and could not pass through the area. Why on earth are these dirtbags allowed to get away with this? I know Seattle is a liberal cesspool, but the law is the law and must be upheld or these anarchist demons will be further emboldened and it will be worse with each successive event where they show up to harass and assault patriots until bullets start flying, all because the police wouldn’t nip this in the bud when they had the chance. Death threat from an Antifa goon who should have been arrested for it…. Same Antifa punk who made the death threat being arrested in August at another protest by Antifa…. Cop tells journalist Andy Ngo he must leave because he is inciting Antifa. This cop should be fired immediately. Incredible. @MrAndyNgo is harassed based on ethnicity and openly threatened with violence. For reporting. In a major American city. These people are dangerous and psychotic.